Though Soul Of A Woman was never intended to be a posthumous release for the mighty Sharon Jones, it stands as both a fitting epilogue for an unlikely career and a comprehensive farewell to a multifaceted star—one that burned unbelievably bright. Courageously recorded with her beloved Dap-Kings between treatments for the pancreatic cancer she succumbed to last year, Soul Of A Woman offers up a piece of everything that made Jones a powerhouse up to the very end. Like all the soul greats, Jones grew up singing gospel in church, her natural talent enough to earn her extra money as a wedding singer, but not enough to surmount the adversity from the closed-minded industry. After years spent trying to find success with various bands, it was late-in-life success that would find Jones—a 1996 background session with Gabriel Roth, Dap-Kings bandleader and owner of the now defunct Desco Records. 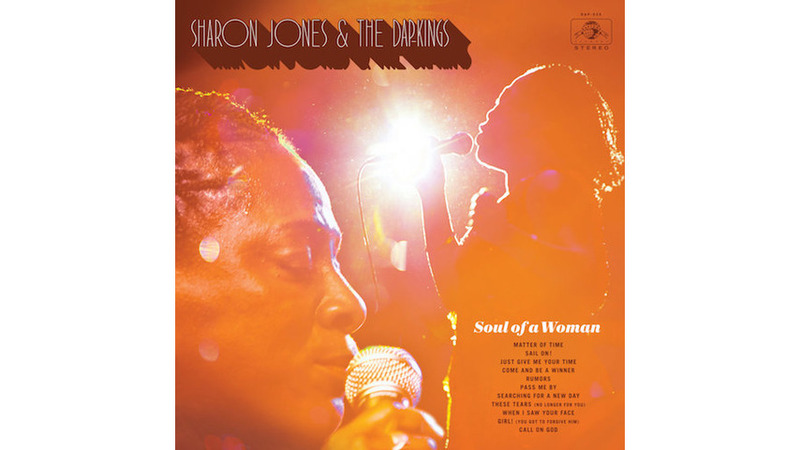 Roth, realizing Jones should be front and center, released a series of singles with Jones before launching Daptone Records—releasing Dap Dippin’ with Sharon Jones and the Dap-Kings in 2002. The first side of the album represents Jones’ carnivorous live performances—the stomping, sweating, unrelenting force of the stage presence that often got her called the “female James Brown.” There’s the funky shuffle of “Matter Of Time,” a punchy study in optimism for the time of Trump which Jones sings with confidence and power, and “Sail On,” an ultra-stylish R&B ode to turning the other cheek filled with an energy so palpable you can practically see her shimmying across the stage one of those little fringed dresses she worked every inch out of. The highlight of this side is “Rumors,” the disparate parts of a kitschy guitar riff, Dap-King grunts, Jones closely mirroring herself in harmony swirling together for the most effervescently playful moment of the album. The second side slows things down, exploring Jones’ ability to grind out pure emotion. “Pass Me By” with its mid-tempo, warm washes of organ, and the sentiment of pushin’ on hits all the classic soul pleasure centers, but it’s “When I Saw Your Face” that serves as the album’s love call. Her voice comes to us as if through a lens smeared with vaseline, the lush horns and soft echo adding to the feeling of blossoming romance. Like Jones, the intrepid Dap-Kings are also in top form, deftly handling everything from latin-infused R&B to the soaring, cinematic strings and dramatic timpani of the Isaac Hayes-flavored “These Tears (No Longer For You), creating the perfect mood for Jones to glide over. The imposing horns, and cymbal crashes of “(Girl) You Got To Forgive Him” affront the listener with sweeping, expansive drama, but it’s still Jones’ voice—filled with authority and pleading—that commands your attention, warning the listener to hold onto their man. For those familiar with Jones’ story, certain lyrics can’t help but take on a deeper meaning. “Sometimes people will treat you like a worn out shoe/But they don’t know that you can’t lose,” she sings on “Come And Be A Winner,” perhaps a reference in kind to the producer that once told her she was “too fat, too black, too short, and too old” to ever make it. The bongos and tambourine of “Searching For A New Day” has Jones nodding to Marvin Gaye as she sings, “Through the hard times/Can’t sit on the sideline.” She certainly didn’t, traveling the country to play shows with stage four cancer. Closer “Call On God” feels the most personal. Perhaps because of the pearly-gates-and-golden-harps feel that takes things back to Jones’ gospel roots. More likely it’s the comforting way she sings, “Just call on God/And He’ll be a friend/,” a message she likely knew she was leaving it behind for those that would miss her most.